How is an action potential transmitted between neurons? When an action potential passes down an axon to its terminal, it must cross a small gap, the synapse (Gr. 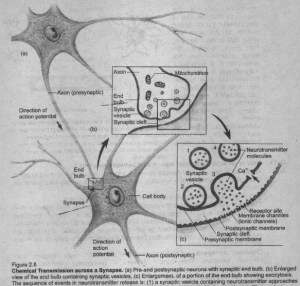 synapsis, contact, union), separating it from another neuron or an effector organ. Two distinct kinds of synapses are known: electrical and chemical. Electrical synapses: Electric synapses are points at which ionic currents flow directly across a narrow gap junction from one neuron to another. Electrical synapses show no time lag and consequently are important for escape reactions. They also have been observed in other excitable cell types, and form an important method of communication between cardiac muscle cells of the heart and smooth muscle cells. Chemical synapses: Chemical synapses are much more complex than electrical synapses. They contain packets of specialized chemicals called neurotransmitters. Neurons bringing impulses toward chemical synapses are called presynaptic neurons, and those carrying impulses away are postsynaptic neurons. At a synapse, membranes are separated by a narrow gap, the synaptic cleft, having a width of approximately 20 nm. The axon of most neurons divides at its end into many branches, each of which bears a synaptic knob that sits on the dendrites or cell body of the next neuron. Acetylcholine molecules diffuse across the gap in a fraction of a millisecond and bind briefly to receptor molecules on ion channels in the postsynaptic membrane. This creates a voltage change in the postsynaptic membrane. Whether the voltage change is large enough to trigger a postsynaptic potential depends on how many acetylcholine molecules are released and how many channels are opened. Acetylcholine is rapidly destroyed by the enzyme acetylcholinesterase, which converts acetylcholine into acetate and choline. If not inactivated in this way, the neurotransmitter would continue to stimulate indefinitely. 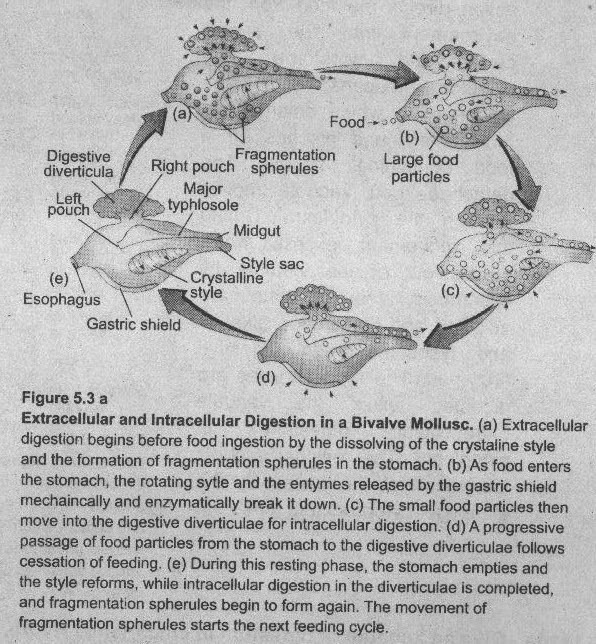 The final step in the sequence is re absorption of choline into the presynaptic terminal, re synthesis of acetylecholine and its storage in synaptic vesicles, ready to respond to another impulse. What do you mean by resting membrane potential? How is a resting membrane maintained? Home » Zoology » How is an action potential transmitted between neurons?